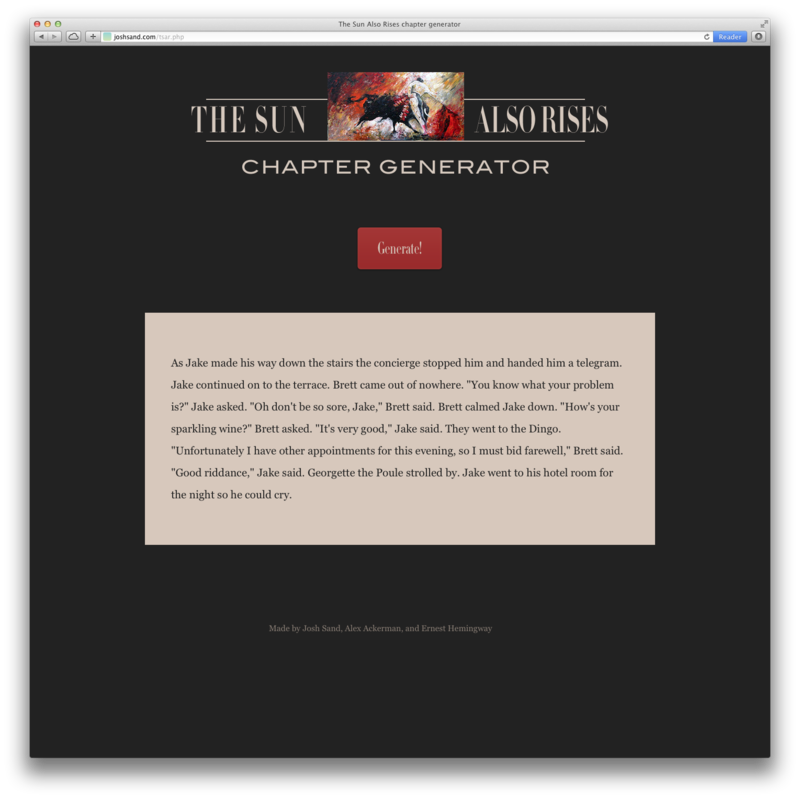 This is generator that makes text in the style of Ernest Hemingway’s The Sun Also Rises. It can be accessed here. It was originally made as a school project by me and Alex Ackerman (me writing and designing, he coding), but being a school project, it was a rush job. I remade it to how I initially planned it when I was learning PHP. It’s not a Markov Chain—it’s all written manually, just assembled randomly. 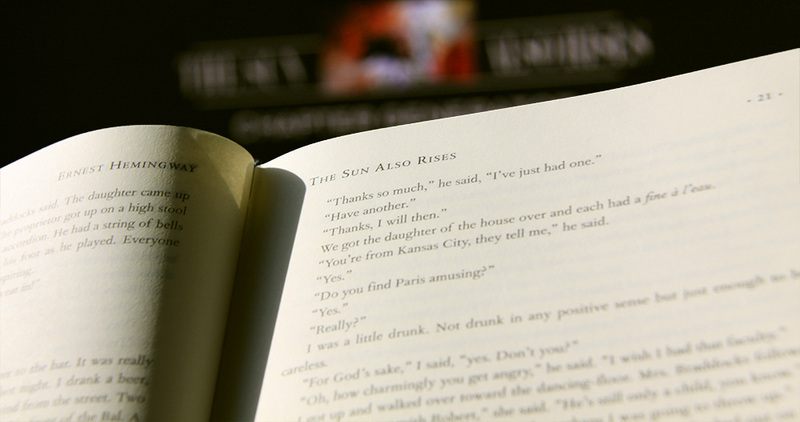 It should ring familiar to anyone subject to the first hundred pages of the book (love ya, Hemingway). That morning Jake went to the Montmarte. Robert was there. “Let’s go to the Madeleine,” Robert suggested. “There’s great margarita there,” Jake said. “And dancing!” Jake smiled at Robert. Robert and Jake touched glasses and toasted. Jake bought Robert some whiskey. “Do you want to dance?” Robert asked. “I’m a terrible dancer,” Jake said. Robert talked about accusations of nastiness. Robert wasn’t thirsty. Brett strolled by. Brett talked about France. Jake asked to dance. “I’m going, farewell, chaps,” Jake said. “About time,” Brett whispered. Robert was drunk. Jake took a taxi-cab to his hotel for the night. Jake got up feeling nasty. Harvey made an entrance. Jake went to his hotel room to think about his infidelity. Jake got up feeling sad. Georgette the Poule appeared. Jake felt sad. Jake poured some fine á l’eau in Georgette the Poule’s glass. “I’ve had enough of you lot,” Georgette the Poule said, leaving. Harvey strolled by. Harvey grumbled at Jake. “Say that again!,” Jake said, rising from the chair. “Calm down, I didn’t mean it,” Harvey said. “I’m sorry,” Jake said, sitting down. “I guess I’m being ill.” Frances came out of nowhere. Frances talked about fishing. Frances bought Jake some tequila. Frances reeled back and knocked Harvey out cold. They went to the Avenue. Frances and Jake touched glasses and toasted. “I’m drunk,” Frances said. “You are drunk,” Jake agreed. Jake frowned at Frances. Frances tipped the waiter. They went into a taxi-cab and told the driver to drive them to the Rue Mouffetard before going to the apartment. Jake was drunk. Jake went home and stared in the mirror. After shaving Jake went to the Liège. Brett walked out of a taxi-cab. Harvey walked out of a taxi-cab. “It’s getting late. See you all tomorrow, I suppose?” Harvey said, getting up. Brett looked very pale. They passed the little square with the trees on their way to the apartment. Georgette the Poule came out of nowhere. “I’m drunk,” Brett laughed. Jake frowned at Brett. Jake lit a cigar. “I’m sad,” Brett said. “You are sad,” Georgette the Poule agreed. “My my, look at the time,” Georgette the Poule said, leaving. They paid the bill and the waiter hailed a taxi-cab to the Dome. Robert showed up. Jake took a taxi-cab to his hotel for the night.